When using Tie Lines for calibrating, or assessing, your airborne LIDAR projects it is often desirable, and in fact recommended to incorporate vertical control into the process. On the other hand, vertical check points are used in conjunction with the Output Control Report tool for reporting project accuracy. The incorporation of vertical control, or known Z, tie lines can help minimize stair stepping from occurring during Z shift (dZ) adjustments on individual lines, while providing a report on the vertical bias of your dataset to the control. In some cases, TerraMatch may even resolve the vertical bias as part of the dZ solution. In either case it is always best to review the updated vertical bias as reported in the Tie Line report after the dZ solution has been applied to the tie lines. To use vertical control you need to have your control in a space delimited text file (Point Easting Northing KnownElevation) or existing as elements within a design file. Then from the TerraMatch Tie Line dialog Import Points (Tie Line -> File -> Import Points -> From text file, or -> From selected vectors). On the Import Points dialog set whether to make the observations of the known Z control using loaded or project points. The fit radius needs to be large enough to incorporate a minimum of twenty points. The require density is typically set to zero for airborne datasets since we don’t wish to favor one line over another as we do with mobile data. The max angle is dictated by the ASPRS specification to be a maximum 10° local slope. This is determined from the triangle formed by the surface directly below the XY position of the known Z point. Note: The import of control is making observations from the data using the tie line settings. Hence, the settings must be appropriate for the data and the control. 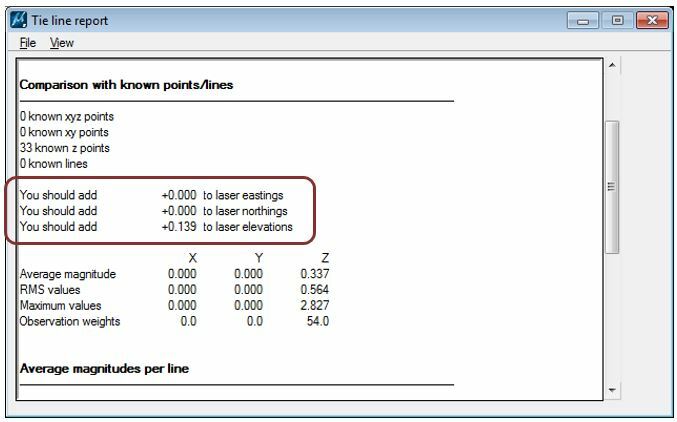 The number one cause of seeing “0 points created from x known inputs”, or fewer control than desired, is that the max error Z is set too small for the vertical bias between the laser data and the known control, hence, the software believes the observations to be invalid and doesn’t keep them. One would need to open this setting up enough to get the software to automatically detect the control. It is recommended that you draw your control into the design file so that you may review the dataset versus the control and determine why a control point observation might not be made. Secondly, if the import process is run against loaded points one needs to be sure not to run with a large number of points loaded or the result can also be zero points created. The same thing can occur if the blocks in a project are too large. When this happens there is an insufficient amount of memory to build the necessary surface models to make the observations. TerraMatch doesn’t report the out of memory error and just reports that zero, or a fewer number than expected, points were created.